Intangible assets are those assets in a business which are not physical in nature. Some examples include: intellectual property, (like patents, trademarks, and copyrights), brand recognition, special knowledge, and business methods. Such non-physical assets add value to a company over time and cannot be destroyed in a flood, fire, or other disaster. Rather they can help build up a company should a calamity strike. Such assets are generally classified into two categories: limited-life intangible assets, and unlimited-life intangible assets. Limited-life intangible assets (sometimes referred to as definite intangible assets), are assets that may expire at some point in time. Patents, copyrights, and goodwill are examples of limited-life intangible assets. These assets are amortized over the course of their useful life, using either a straight-line method or units of activity method. Conversely, an unlimited-life intangible asset (or indefinite) intangible asset is a non-physical asset that will stay with the business as long as it exists. A company’s brand name and trademarks can be just as valuable as its tangible assets (or in some cases – like the Coca-Cola Company – may be more valuable than its tangible assets). Coca-Cola’s branding has been driving its sales for decades. Unlimited-life intangible assets are not amortized, since they will continue to provide value to the company over their lifetime. Accounting for this type of asset on a company’s financial statements can be complicated since its value is often difficult to determine. While tangible assets add to a company’s current market value, intangible assets generally add to future worth. One way to approximate the value of a firm’s intangible assets is to to deduct the net value of the company’s tangible assets from the market value of the company. The remaining amount is a good estimate of the value of the company’s intangible assets. If an intangible asset’s value ever falls below its carrying amount (or its actual historical cost), the difference is recognized as an impairment expense for the current period, not to be spread out over several periods. 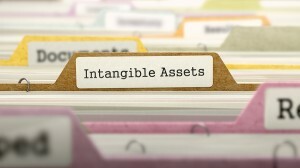 Intangible assets are those assets in a business which are not physical in nature, such as intellectual property, brand recognition, and proprietary methodologies. Such assets are generally classified into two categories: limited-life intangible assets, and unlimited-life intangible assets.